CONTINENTAL MIX - A classic from roasted peanuts and airy rice crackers with original Japanese Soy Sauce. A very tasty premium Snack mix. PEANUT, vegetable oil, rice, salt, SOY SAUCE, sugar, mod. starch, seaweed, SESAME chili. May contain traces of NUTS. Roasted and salted peanuts have always been one of the most popular snacks. As a healthy source of energy, they are on the TV couch or evenings parties simply indispensable. Another extremely popular favourite in the nibbler world is the Japanese rice crackers, which is also in western european climb on the rise, for many years. In our CONTINENTAL MIX we therefore combine these two snack specialties in a premium Snackmix. Crunchy nuts kernels and crunchy rice crackers. 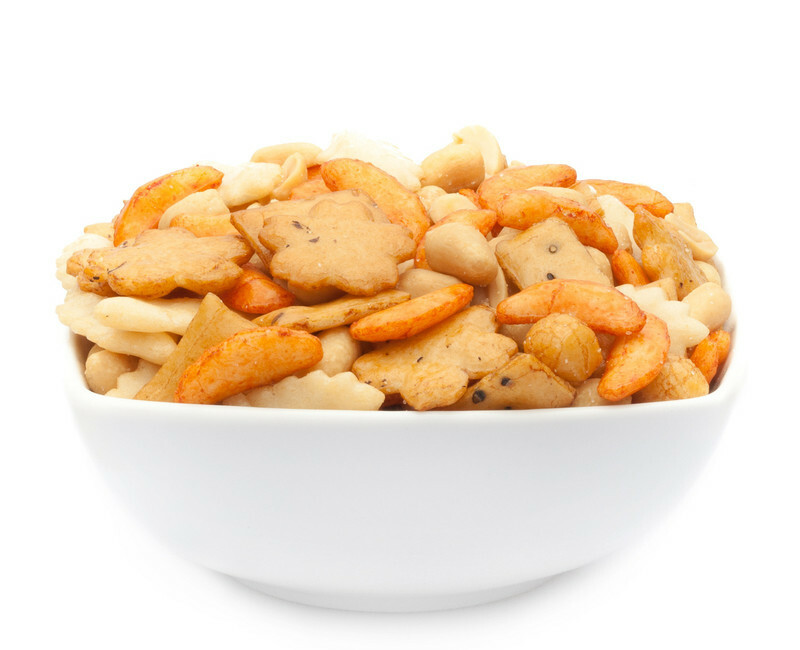 The fine-spicy aroma of lightly salted peanuts harmonizes perfectly with the slightly sweet refined with original Japanese Soy Sauce rice crackers. Our CONTINENTAL MIX is an extremely sensual snack pleasure, tasting at the highest level, the deep branding in your taste memory and seduce you in a discreet manner. We give great importance to quality ingredients and careful preparation of our premium snacks. Our CONTINENTAL MIX contains gently roasted peanuts, flavoured with a fine salt note. The refined soy sauce with rice crackers are fat-free baked and, are therefore, inimitable crisp and spicy taste. Continental MIX offers itself brilliantly to beautify itself a stressful day at the office with these two great snack elements or to watch an exciting movie on TV, reading a book or just relax on the sofa in a relaxed position during the day. The palate wide open, gradually disappear the crunchy peanuts and rice crackers, while already are excited and delighted the taste buds to enjoy the tasty seasoning. But be careful: the CONTINENTAL MIX has real potential for addiction and just makes you want more. Treat's you, you've earned it. When snacking, then please do it on the highest level!